National Croissant Day is January 30th - how will you be celebrating? Textbook Patisserie's John Ralley has created possibly the most on-trend croissant of the year so far. 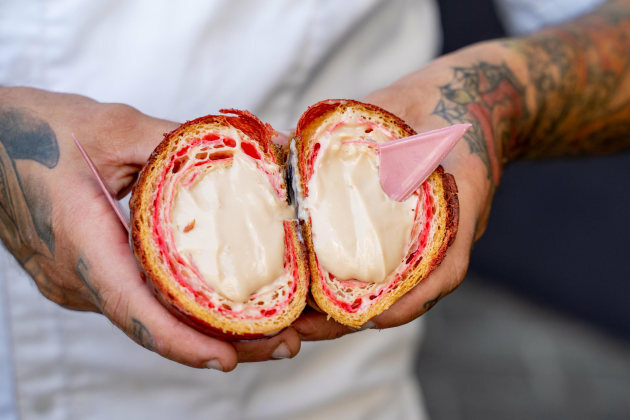 Using Callebaut's ruby chocolate, which was unveiled in Australia in July 2018, the dough master has made a pink pastry oozing with rich, creamy, slightly fruity and tangy cremeux. Add this flakey, gooey beauty to your menu on the 30th. In a bowl knead the bakers flour, caster sugar, salt, milk powder, 15g unsalted butter, egg and water together to form the dough. Placing the dough on a floured surface knead for a few minutes, then transfer the dough into a lightly floured bowl and leave it in the fridge to rest for 24 hours. Slice the 200g of unsalted butter into thin strips and place them in a square on a piece of baking paper. Place a second piece of baking paper on top of the butter square and using a rolling pin, roll the butter flat, trimming the edges and placing them on top as you go to create a neat square. Place to the side. Take the dough out of the fridge and place on a lightly floured surface and begin to roll it out to a square larger than the butter. Place the square of butter in the centre of the dough and fold each corner to cover the butter. Lightly sprinkle some flour on top and using your rolling pin, roll the dough out to a long rectangle. In a saucepan mix together milk and cream and bring to the boil. Add in sugar and egg yolks and cool to 83ºC. Once the mixture has reached 83ºC add in the gelatin sheets. Finally, add in the Callebaut Ruby RB1 chocolate and stir until completely melted. Place the dough on a lightly floured surface and use a rolling pin roll it out to a long rectangle. Using a ruler mark a spot every 8cm x 26 cm and cut the dough into triangles, ensuring that the edges are straight. Place a dough triangle on a lightly floured surface with the tip pointing away from you and gently stretch out each corner. Place 100g of the Ruby Cremeux filling along the base of the triangle and starting at the base, roll up the croissant toward the tip, tucking the tip under the croissant. Curve the ends slightly inward to create a crescent shape. Place the rolled croissants on a lined baking tray 10cm apart and leave them to rest for an hour or so. Lightly brush the croissants with an egg wash.